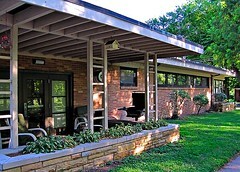 Here's a photograph of a wonderful mid-century modern structure in Florissant that will be coming up for sale soon. It was photographed and described by my friend Toby Weiss on her blog B.E.L.T. (Built Environment in Layman's Terms). Check out her blog posting to see more photographs and get the full story behind this unique structure.